CVSWMD's "Did You Know?" Ad Campaign, funded in part by CVP Connect, correlated with an increase in recycling and business composting in our region! 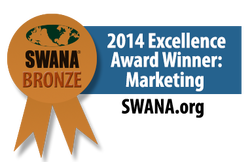 Our "Did You Know" ad campaign earned the 2014 Bronze Excellence Award for Marketing. It ran from November 2013 - March 2014 in print and radio, featuring information about recycling and composting. Scroll down to hear the radio ads. Check Out our Other Radio Messages! Did You Know? Americans Waste over 40% of food. Compost ad. Did You Know? Paper Recycling ad.